It all began with a collage. I had an assignment to fill several pages in a Traveling Art Book. I had no plan nor was I conscious of an issue concerning my role as a woman. I simply cut out images that caught my attention. But a theme soon began to emerge. 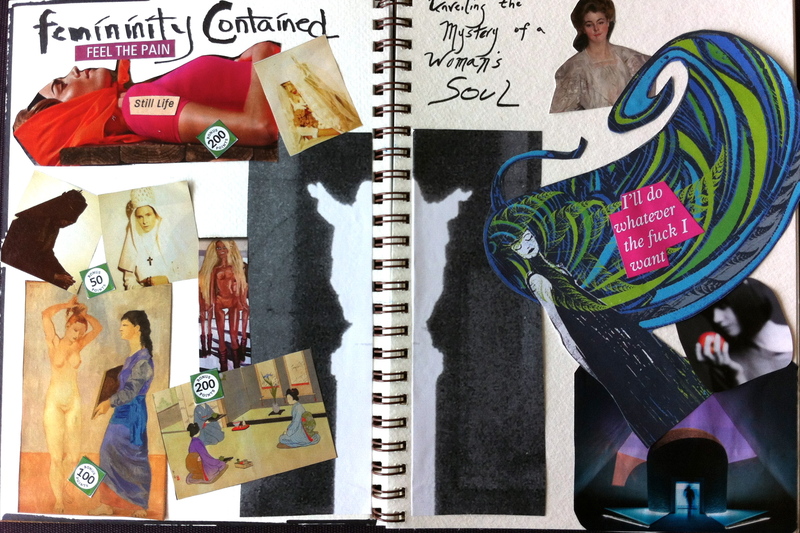 On the left page I explored Femininity Contained; a perfectly coiffed woman demurely covering her hair, a naked Barbie, the Virgin Mary, a Japanese woman’s tea service, and of course the perpetual gazing into the mirror, asking, am I acceptable yet? The bonus points represent the rewards I felt I received if I behaved appropriately. On the right page I explored Femininity Unleashed; a woman with an enigmatic smile, a woman whose wild hair reflects her personal freedom, Eve choosing to eat the apple, forcing her from the known to the unknown, and a woman walking into the mysteries of the dark, the unfathomable, the unexplored depths of femininity. And then there is the image of Christ… in the centre. I believe his arms are raised in a gesture of supplication, asking for help from a power greater than himself. I too feel helpless. I have lived a very narrow life as a woman, never feeling free to examine the complexity of my femininity. I no longer want to feel contained, but I am anxious when I move to freedom. So I am stuck, in the quagmire of indecision; the old no longer desirable, but the new too unfamiliar and seemingly forbidden. So the purpose of my blog is to explore the energy of “The Other Woman”. “Other” being any aspect of femininity with which I am unfamiliar. Hi Daniela! I have been reading your observations and musings, and enjoying your ‘take on life’ very much!